On Monday we welcomed our staff back for the start of a﻿﻿﻿new term and new year and for the fourth of our crucial Canons OPP INSET sessions of the year. 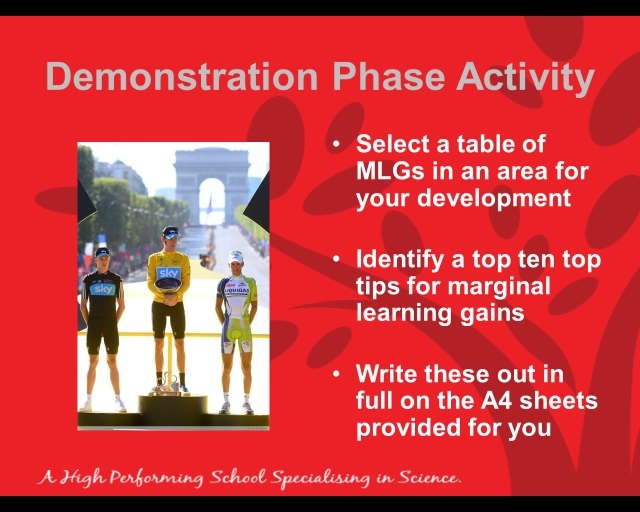 For this INSET day our main focus was on in-class evaluation processes, but we wanted to start the day with an activity that involved all teachers in understanding the concept of Dave Brailsford's Marginal Gains ethos that underpinned the successes of cycling's Team Sky and Team GB in 2012. 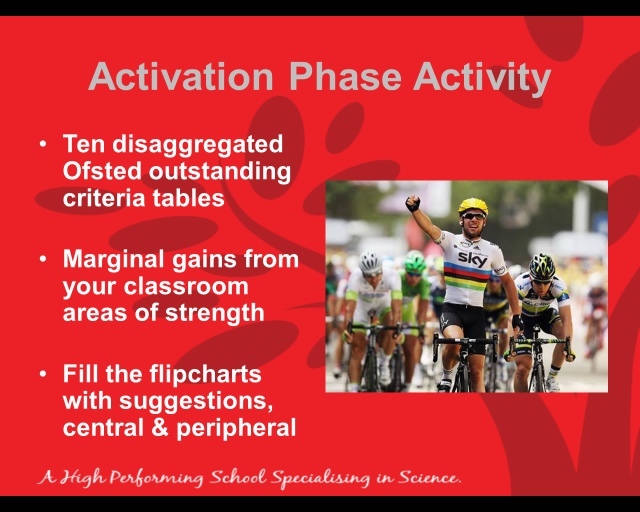 The start of the session involved asking staff to identify Dave Brailsford (I've never seen PE staff so keen to contribute to an INSET Q&A - Thanks Alex!). 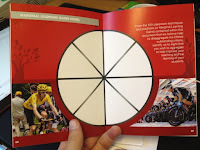 We then watched the video of Brailsford explaining to BBC Breakfast the theory behind Marginal Gains and how it helped his teams achieve success this year. 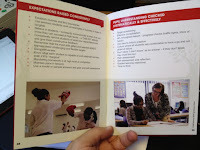 A summary of the key points outlined in his interview can be seen to the right, which was shared with staff in the context of Canons. 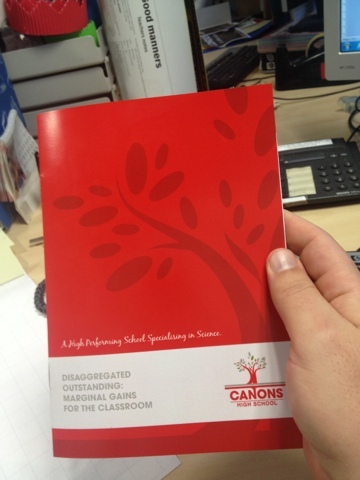 Work has already been done at Canons to disaggregate the Ofsted outstanding criteria. 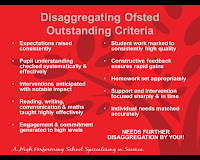 Following a suggestion by Alex Quigley at Huntington School (@huntingenglish to the twitterati), the aim of this session was to 'crowdsource' these ten disaggregated criteria, disaggregating Ofsted outstanding even further to allow it to be conceptualised in terms of concrete classroom practice. 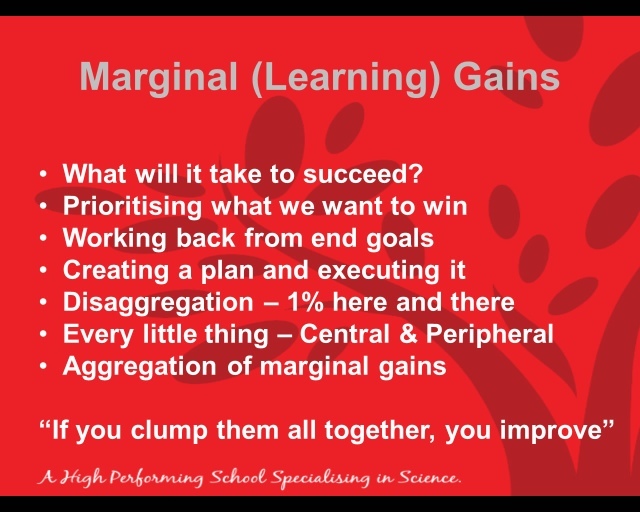 The key point made throughout this session was that as an already outstanding school aiming to become great, we need to be looking to Marginal Gains to help us on that journey. 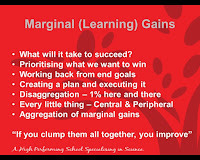 We also insisted that the vast majority - if not all - of these Marginal Gains were already present somewhere within the school in the classrooms of our colleagues. 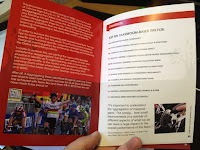 This informed the first part of the 'crowdsourcing activity'. 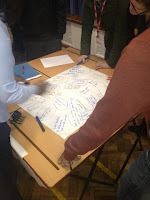 Teachers were asked to take ten minutes to consider the ten disaggregated areas of the Ofsted outstanding criteria and consider what aspects of their own classroom practice they were proud of and that would constitute a potential Marginal Learning Gain to other teachers. They were asked to "sweat the small stuff" and "look after the pennies to save the pounds", concentrating on the 1% gains that would be relatively easy for colleagues to take on. Over the course of the ten minutes some staff got straight to it, whilst others spent time considering their contributions. 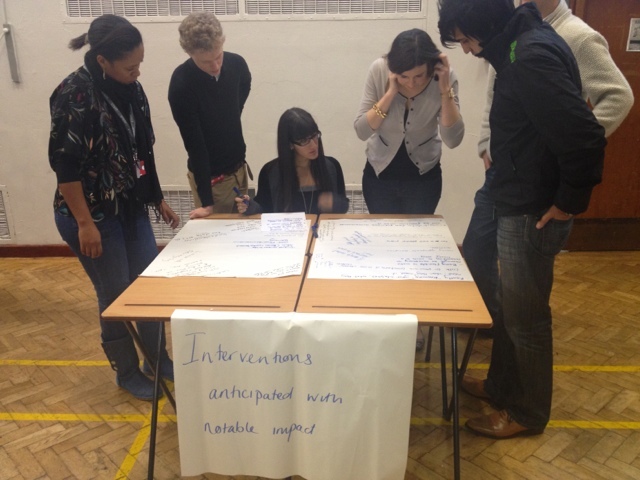 Some moved around a large number of tables whilst some decided to stick with one or two. 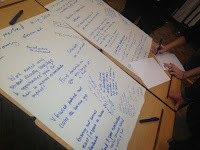 The aim was to have at least twenty suggestions for each area, requiring a contribution of at least four ideas from each teacher in the room. The best oral feedback I have had so far is that the focus on our own strengths was really heartening for staff. 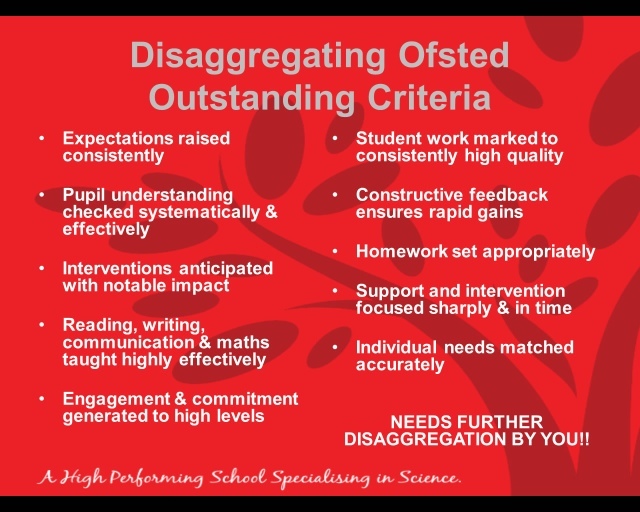 Of course, during this process there were a few areas of the Ofsted outstanding criteria that received more comments than others. To help ensure all areas received equal attention I buzzed around shouting out where we could do with more comments and reminding colleagues of the wonderful work that they had done or were doing that I had seen or heard about: Not a bad way for any member of SLT to begin the year, shouting out positives. 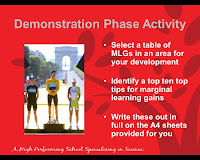 Once the ten minutes were up I called for staff to stop and, as they expectantly and longingly looked at their chairs, asked them to find an area of the disaggregated Ofsted outstanding criteria where they felt less confident and, in discussion as groups to go through the suggestions made in the first activity to identify the Top Ten Tips on the sheet that could be passed on to all teachers, including newly appointed NQTs and our next wave of PGCE students. Over the next ten minutes each table identified their own ways to reduce down the suggestions that they had inherited. Some got straight to it and circled the ones that stood out most to them. Others took time to consider how different suggestions could be amalgamated to ensure that no good idea was lost in the process. Some groups appointed someone to make decisions for them and some gravitated towards a powerful personality. Some bickered and others agreed wholeheartedly. Some struggled to complete the task so rounded were their discussions. It was not unlike watching learners of any age complete a task rooted in interdependence and collaboration: a pleasure and a privelege. The point of asking the teachers to create a Top Ten Tips was to ensure that the final ideas were refined enough, and by asking them to lead on this distillation process in an area of relative weakness or uncertainty for them was to ensure that the tips created would be relevant to those most in need (or in want) of their development. Having involved them as experts in specific areas we wanted to engage them as the critically reflective practitioners we know them to be. The purpose behind the whole activity was twofold. Firstly, to take the time at the start of the new year to remind our staff that they are outstanding at what they do. Secondly, to support them in their individual and collective quests to get ever better. 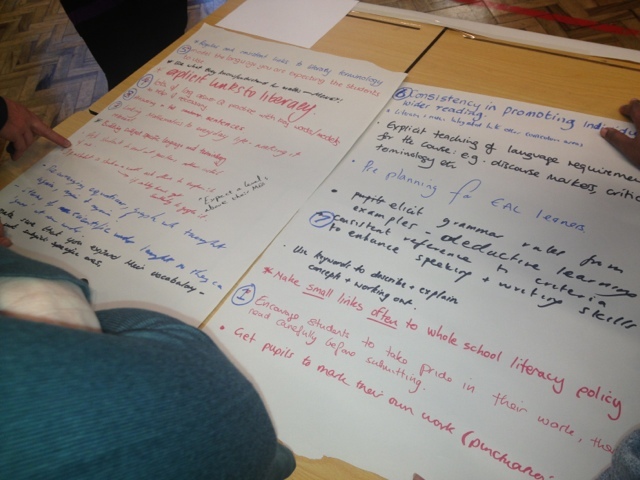 We asked them, in their own time after the day to look over the Top Ten Tips in the ten disaggregated areas of Ofsted outstanding criteria and identify eight areas of practice the would like to tweak. 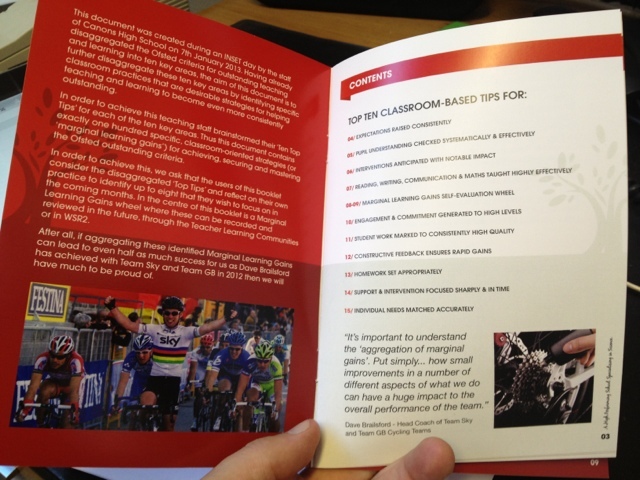 As well as using the artwork of our school brochure we decided to lace the booklet with images related to cycling, Team Sky and Team GB to retain the theme that had dominated during the presentation and to reinforce the notion of excellence (or greatness) that is at the heart of what we are doing. Using shutterstock for selecting these images ensured that we were copyright-safe. MLG booklet printed the same day!! The work that was put into the booklet by myself and our school Office Manager, Jackie, was well worth the time and the very reasonable price. A photocopied booklet printed in school could not possibly, however lovingly crafted, have conveyed the same sense of quality and professionalism. Having collated the ten groups of Top Ten Tips for each area of the disaggregated Ofsted outstanding criteria, we typed them and sent them off to the publisher where they were aligned with fabulous pictures of our staff and students. 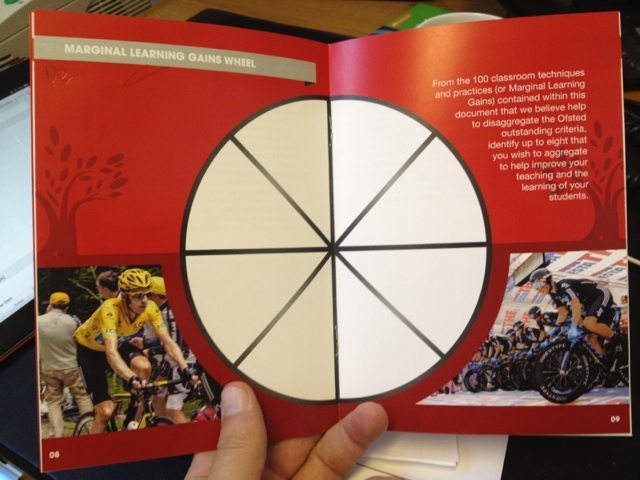 The main focus of the booklet, though, is the Marginal Learning Gains wheel that sits at its centre in between photos of Bradley Wiggins (representing individual success) and Team Sky (representing school success). With thanks to Zoe Elder (@fullonlearning) amongst others, we have borrowed the ideas of others to produce a beautiful 'crowdsourced', expertise-laden, development-focused booklet that is all about the Marginal Learning Gains and I couldn't be any prouder of the process that our staff went through in this INSET day or the product that they created.